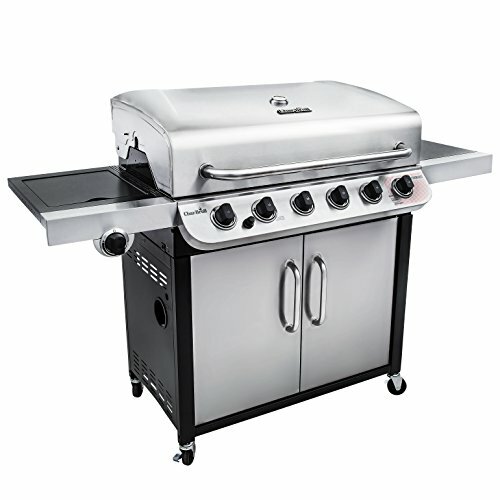 Char-Broil has been very enthusiastic about the Performance 650 Cabinet Gas Grill. And on the face of it, they’ve reason to be. Grills this large for around 330 dollars are a few and far between, so they’re definitely offering something which at first glance seems great value. But we’re not folks who glance. We’re not people who take one look and make a call. We’re going deeper, into the smaller print and out the other side. I’m going to tell you how this thing really works. And, that’s going to include it’s shortcomings as well as it’s areas of success. This way you’ll have a true picture of what you’re going to get from owning this Grill, so you can decide if you really want it. The size and design give us the first glimpses of how they got the price down to just over 300 dollars for a huge Grill like this. It’s made out of solid Stainless Steel with Metal Side Shelves. They do not say which Grade of Metal they used, but the weight kind of gives it away so does the feel. It’s 127 pounds out of the box, which is lighter than most comparable Grills, meaning they used a lower grade of Metal than they did on their higher-priced models. This is not a major critique because they knocked 200 dollars off the price and it will be durable. But it was worth pointing out. Other than this I have only praises for the design. You get some nice Side Shelves, along with a very attractive Lid and lots of storage space beneath the primary cooking surface. You get a giant 650 Square Inches of Primary Cooking space. This is easily enough for around 35 Burgers or 25 Steaks. So it’s one of the biggest Grills on the market for the price. It’s a huge unit in general when you add the Side Shelves and storage so full marks to Char-Broil on size. It’s the same Swing Away design secondary cooking area they put on the Performance 475, which I also reviewed for this site. Here you get 280 Inches of extra space and you’ll be using this mainly as a Warming Rack. When you’re not using it, you can swing it away into the Lid, or remove it completely. It’s a nice addition to a Grill that didn’t really need more space, but they offered it anyway. This Warming Rack will definitely help when to have a big party at your house and you need to cook 35 Burgers whilst keeping another 15 warm. The big issue with the Performance 475 was that they totally miscalculated the amount of power they’d need to cover the space provided. They only gave 36,000 BTU’s of power per hour when around about 47,000 BTU’s where needed. So their beautiful Cast Iron Grates had to come to the rescue, otherwise, the heat dispersal would have been lacking. On the Performance 650, they got the power to size ratio almost exactly right. You get 60,000 BTU’s across the 6 Burners to cover a total of 650 Square Inches, which is close to the perfect 100 BTU’s per Square Inch you should be looking for. Call it a learning curve and Char-Broil learned. So there is more than enough power to disperse heat across the entire cooking surface, for fast, evenly cooked food just as you like it. They kept the same Grates as on the Performance 475. They’re terrific Cast Iron Grates, of the perfect thickness to retain heat and disperse it rapidly for fast cooking times. They also give you an even heat so Steaks aren’t rare in parts of the cooking area and well done in other parts. Plus Grates like these make sure food doesn’t stick so there aren’t burn marks all over meats. I’m a big fan of Char-Broil Side Burners. For many manufacturers, a Side Burner is something you’d do a Sauce on. For Char-Broil it’s something with enough power for cooking. So you can do Sauces by all mean’s, but with 10,000 BTU’s an hour of power, you can easily boil some Vegetables, make some Pasta or do anything else you’d usually use a Pan for. Unlike on the Performance 475, they’ve provided a sixth Burner here. It’s interesting because it’s for direct high heat Searing. I liked the taste of Steaks using the primary cooking space, so the extra searing Burner is something I wouldn’t use a lot. But, some people love the taste of seared Steaks and here you’ll get the opportunity to utilize the searing option. A nice little extra that gives the 650 a distinct advantage over competitors. Everything is Porcelain-Enameled so dirt and any other debris just falls off quite easily. Simply take a wet wash rag and lightly scrub to clean. You should clean once a month minimum although once a week is what we always recommend for Grills. It’s the same one as on the Performance 475 and it works just as well. It’ll start first time every time and this has become a strong suit of the Char-Broil brand. They where one of the first to use Electric Ignitions and they’re one of the best at designing them. You’re starting to see that this is a bigger version of the Performance 475, with a few issues that have been resolved. One of these was storage. Storage is much better here. You get two huge cupboards covering the 650 Square Inch area below the [primary cooking surface. It’s more than enough for a whole family. One of the only problems with this Grill is that like the Performance 475, they put the Thermometer on the Lid. I like to be able to read heat with the Lid open, but you can’t here. For some people, this won’t be a problem though. The Performance 475 was a nice Grill that created great tasting food. But it was not without its problems. They messed up on the power to size ratio so there really wasn’t enough BTU’s for heat to be quickly or evenly dispersed over the cooking surface. Here they’ve solved that problem by providing just enough power for the 650 Square Inch surface. So you get the kind of Grill the 475 should have been. Plus you get those fantastic Cast Iron Grates that saved the day for the 475. These really are superb to cook on. You also get the easy to clean surface, Electric Ignition and the 10,000 BTU Side Burner they provided on the 475. So you get off best of it, without its power issues. There’s increased size, increased storage, a total of 6 Burners including the interesting Sear Burner which you won’t find on the 475. 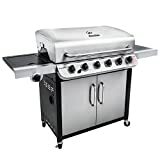 I can’t fault this Grill because Char-Broil clearly learned from their experience with the 475, which represented great value for money but needed power improvements. One of the best value Grills on the market. Thank you for reading.